Note 1: As you become older, the things you like change and evolve as you do. But there would always be a few things from your childhood which stick with you. 'The Road to El Dorado' is one of those few things for me. Note 2: I've been meaning to write this since quite some time now, among other things. Better now than never. Hopefully this will drive me to publish all those "drafts" in my head soon. The premise - two small-time con artists in 16th century Spain get hold of a map to the fabled city of El Dorado, the city of gold. The quest for the hidden treasure takes them on an epic journey of discovery. They reach El Dorado and are proclaimed Gods. 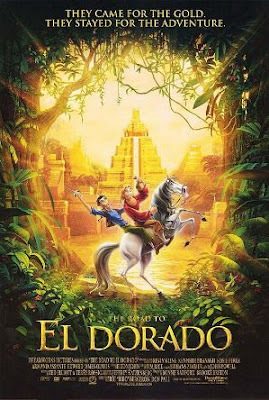 Loosely inspired by Kipling's 'The Man who would be King', with real-life references to Cortés, the premise is beyond magical and fascinating for a 12-year old, already hooked to "treasure hunt" adventures of Uncle Scrooge and his three mischievous nephews. I watched it for the first time as a kid, and then again several times in the next few years. Maybe this is why the movie stuck with me, because every time I watched it, it had something new to offer to me. And not in a 'V for Vendetta' kind of way, where when the first time I watched it (still in school) I went, "Why in God's name is this man wearing a mask? Can someone please tell me what the hell is going on? ", and then later having understood it I went, "Oooo, okay. Okay, I need a moment. Woah!". But in the kind of way 'Wall·E' is going to grow on today's kids 5/10 years from now. Tulio: If it's any consolation, Miguel, you made my life an adventure. Miguel: And if it's any consolation, Tulio, you made my life rich. Miguel: I will cut you to ribbons! Tulio: Fool! Such mediocrity! Let your sword do the talking! Miguel: I will, it will be loquacious to a fault! The movie pays tribute to the 'Road to...' movies made in the 1940s and the 1950s, and just might be the greatest bro-mance ever featured in an animation film. And the innuendos and the references in the movie! It is really a shame that the movie did not "perform" at the box-office. Dreamworks had plans for sequels for this movie, and now we will never know. [sigh] If you haven't already watch this one, do, you will be pleasantly surprised. I found a bootlegged version of the movie here (if you don't mind the Arabic subtitles), but I sincerely urge you to watch the movie in it's high-resolution glory. I didn't know if that had been a dream; or if this was a nightmare. Whether it was U who kept him living; or whether it was I who kept her living in him. I thought I gets it. But I didn't. I was so far away from home, far away from everything familiar. Too caught up with things that did not matter. Too caught up to get a moment to even think about home. And yet, I missed U. Every second. This, could never feel like home. Maybe because it was U who made it feel like home. I saw the world, I went places. I wished U was there with him. To share. Why it mattered so much to him, I did not know. "Get over it. Big world. ", they said. "One life. ", I replied. The bigger challenge is not to find your princess. It's been some time now. It seems like it was only yesterday when I felt on top of the world. How did this happen? Or maybe the better question was, when did this happen? I used to think, trying to understand why it meant so much to him. We are flesh and bones after-all and we will all perish one day. It is the inevitable truth. Does it really matter who you die with? Maybe it's about living with. Yes, I knew who I wanted to live with. That dream, to live in a beautiful house, with a sedan parked in the driveway, a lush green lawn with flowers in front and a kitchen-garden at the back of the house, raise kids, have a family, that dream, was still living. I had seen the dream more clearly now. I had seen who else was in the dream with him. It's been a long stay away from home. It was time to go back. Home? I wasn't so sure. I sat by the window on the plane, with his earphones plugged in. It was night and the moon was full as he flew across the seas. A song started playing. It was U's favorite song. The clouds below seemed like an endless ocean, calm and serene, happily flowing, oblivious to what went on below. None of that mattered, it seemed. And just like the explosion of colors when the sun sets in the ocean, I saw the full moon in the starry night, and I could see the reflection of the moon in the clouds, in so many shades as he had never imagined, dazzling streaks of silver dancing across the scintillating sky. I was stunned as I witnessed this magical choreography. It looked angelic. And as I beheld this spectacular sight, and as I was listening to U's favorite song, I drowned. Drowned in thoughts, of what was, what is, and what could be. The only imperfection in this moment was that U wasn't there beside I to hold his hands and to whisper those words into his ears, again. As U walked out of the airport, oblivious to the life that was waiting for him, I stood there, waiting for him. U saw her standing, and didn't know what to do. He was stunned. U walked up to her. "I thought it wasn't a movie. It might have been afterall, and I still don't know it ends. ", U said. I gently smiled, and had a tear in her eyes. Her lips trembled. "I love you", I said. I, U, became V. And V make us extraordinary. I is a normal guy. I likes to watch his movies, play his games, read his books, you know, the whole shebang. I has a lot of friends too. I never felt alone. I's friends though, happy as they were, used to talk about the girls they saw and met, about how beautiful they were, and how the girls giggled during the dinners they took them to, and how their giggles made their hearts skip a beat. I was always amused when I heard these stories. They were fun. Both when the stories progressed beyond the first dinner, and when they didn't. I enjoyed the stories, but never understood them. Post-pubescent babble, I used to call it. It wasn't that I didn't want to be with a girl some day. Oh no, no. I always intended to get married, to an intelligent and mature girl, live in a beautiful house, with a sedan parked in the driveway, a lush green lawn with flowers in front and a kitchen-garden at the back of the house, raise kids, have a family, you know, the whole shebang. But, I found the all girls to be, alike. They lacked, you know, a character, a personality. And I thought his friends were lame when it came to girls (or, had an ulterior motive). Good for them, I thought. Until one day, I met U. The ground beneath I's feet trembled, or maybe it was just I's legs. I had always believed that to know someone, one needs to talk to the person, spend time with the person, and if one is lucky, one will get to know the person. But I was surprised when just one glance felt like I knew U. And a split second later, I thought how lame it sounded even inside I's head, so I better not say it aloud. To anyone. I decided to talk to U, spend time with U, you know, get to know U. I did that. I had thought that it was only a matter of time until everything would become normal again. On the contrary, I found that his first instinct got reinforced, his feelings, stronger. Weird, I thought. This had never happened to I before. I was baffled. I decided to talk to his friends about it. Of course they had experience with such situations, they might be able to help him figure it out. I told his friends about how beautiful U was, how U's one smile lights up his day, how I cannot stop thinking about U every breathing moment, and how every time his phone rings, he excitedly looks at his phone to check if U had called, about how he eagerly waits and plans for the few hours I sometimes gets to spend with U, about how I could do just about anything if it made U happy. And after I had finished the monologue on how U is the most extraordinary person I has ever met, I heard what he had just said, and realized, I was turning into them. Now, I found himself in a situation he never thought he would be in. I was lost. I thought about it. Now I gets it. Maybe he was wrong before, and his friends weren't lame to talk about girls that way. Maybe they really felt when they talked about them. I wanted to express his feelings. U smiled. I didn't know what to do. Kiss? That's how it happened in movies, I thought. But this wasn't a movie, I was sure. And the more time he spent thinking about what he should do next, the more awkward he knew it would become. His friends had warned him. "Are you sure about the 'I love you'-return? ", they had asked. And I had replied that it didn't matter. What mattered was for him to be honest with his feelings. "Dreamer! ", they had said. I did not let it get uncomfortable. I had expressed his feelings, and that is what mattered. Anyway, they went for a movie afterwards, and later had dinner. The noisy world suddenly started feeling disturbingly silent to him. When he was at her doorstep, bidding good night, U asked, "Why?". And I told her everything he had told his friends before. U smiled, and went inside. I went home. I could not sleep that night. I's friends told I that I was only a normal guy, and U was an extraordinary girl (from how I had described U, they said). It did not make sense to them. Why would she be with him? Seconds ticked away slowly, and the night passed. The next morning I's phone rang. It was U. I nervously took the call. "Why didn't you kiss me? ", U asked. "Because I thought it wasn't a movie! ", I blurted. They both laughed. "We make us extraordinary", U said. "I love you. ", she said.